I’m writing this on a rainy Sunday afternoon, our last Sunday in Bangkok. Thursday morning, we leave to return to America, so I’m feeling contemplative. I posted a blog article in late September about good and bad decisions we made in the early part of our trip. We’ve made lots of other good and bad decisions along the way, over the past four months. But one of the best decisions regarding Bangkok was choosing a hotel. We decided on Pas Cher Hotel de Bangkok almost by accident. Back in late October, when we were in the Philippines, Beth was doing a lot of research online about where to stay in Bangkok. We’d never been here before, and about all we knew was that it was a good idea to stay near the river, since it’s sort of the heart of the city. And we knew staying near a BTS (their elevated metro system) station was also a good idea. This hotel had both things going for it, pretty good reviews, and a reasonably price in our budget. So we stayed here a few nights before moving on. Since then Beth has been back to this hotel twice, and I’ve been here another three times. We still like the hotel itself, and the staff, but what really sets this place apart is the neighborhood. Bangkok is divided into 50 districts, one of which is called Bang Rak, and that’s where Pas Cher hotel is. This district has a mix of middle class housing and international tourist hotels, old historic houses and modern high rises, inexpensive Thai food stands, and foreign food restaurants, including Chinese, Japanese, Korean, and American. Shopping is a mix of day and night outdoor markets with different specialties, department stores, and standalone shops. Since we can’t cook in our hotel room, we dine out at least two meals every day, sometimes more. The hotel plan we’ve gotten each time includes breakfast, but sometimes we go out for a second breakfast if we want something special. And lunch and supper are both eaten out every day except when we take leftovers back to our room. So I’d done a lot of sampling of a lot of different low- and medium-price food options in the area. That suits me just fine, as you can imagine. Here’s part of a typical breakfast from our hotel’s breakfast buffet. They offer both Asian style breakfast items and Western style breakfast items. But other than the toast, butter, and jam, I’ve found the Western items to be pretty gross. That includes sunny side up eggs and sausage that looks and tastes like American hot dogs. But the Asian items are more interesting. 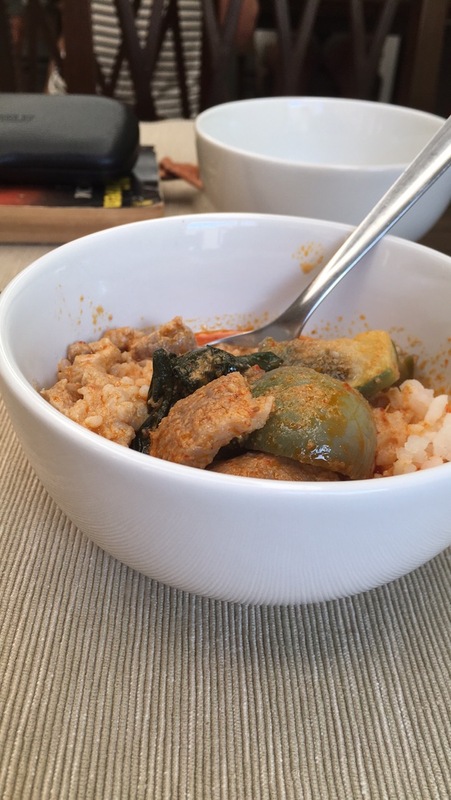 Usually there’s a Thai curry dish with white rice, like this. 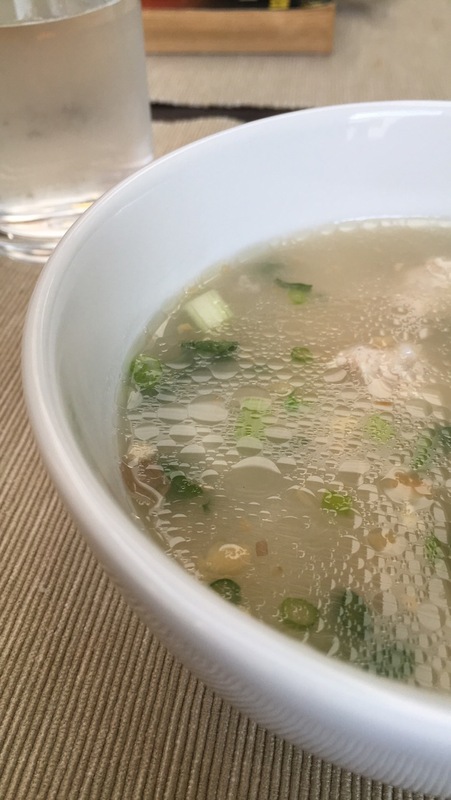 And every morning they have rice soup with green onions, some other herb, and some chunks of ground meat (pork or chicken, I’m not sure). I really like this stuff. The rice isn’t cooked way down like with congee (I wish it was); the grains are all solid and whole. One of the herbs they use in it must be the same as something in pho, because even though I can’t identify what it is, it hits the same taste buds. Another nice discovery I’ve made in the Bang Rak area is an art gallery and cafe called “bridge” (always spelled lowercase, apparently). By pure luck, it’s located not far from the Pas Cher hotel where we’ve been staying. There are several coffee shops closer, but they’re chains – a Starbucks, a Black Canyon, and a Coffee World (in decreasing order of price). I like supporting my independent coffee shop when I can, and I found bridge. The whole time I’ve been here has been between art exhibitions, so I can’t speak for the art side of things. But their cafe is great. They have very good food and coffee, friendly service, and a comfortable space. 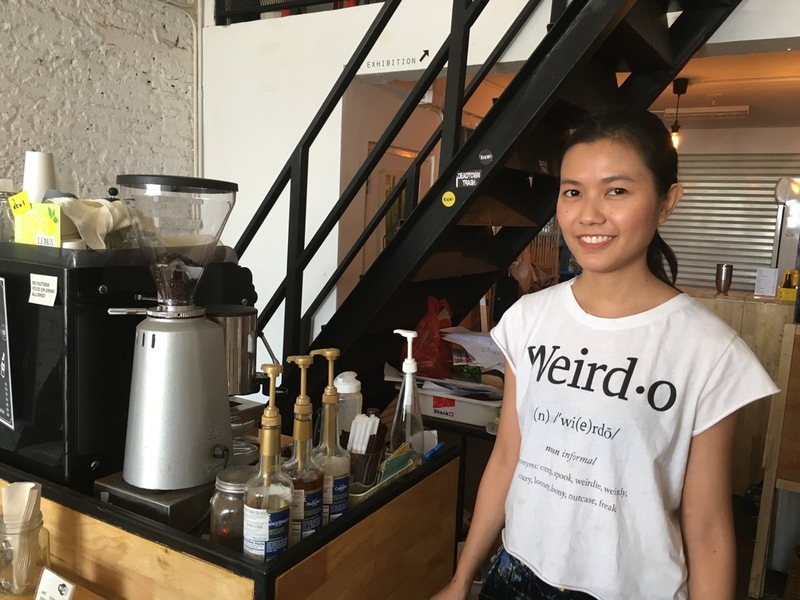 Here’s the main barista who has been there every time I’ve visited, next to the espresso maker and related stuff. She’s very nice, speaks English well, and is a great cook. I think she told me her name once, but I can’t remember it. I guess you could say the coffee drinks are almost all Western style food, since they’re Italian style espresso drinks for the most part – cappuccinos, lattes, and so on. Their food menu has Thai food, Chinese food (I think), and Western food. 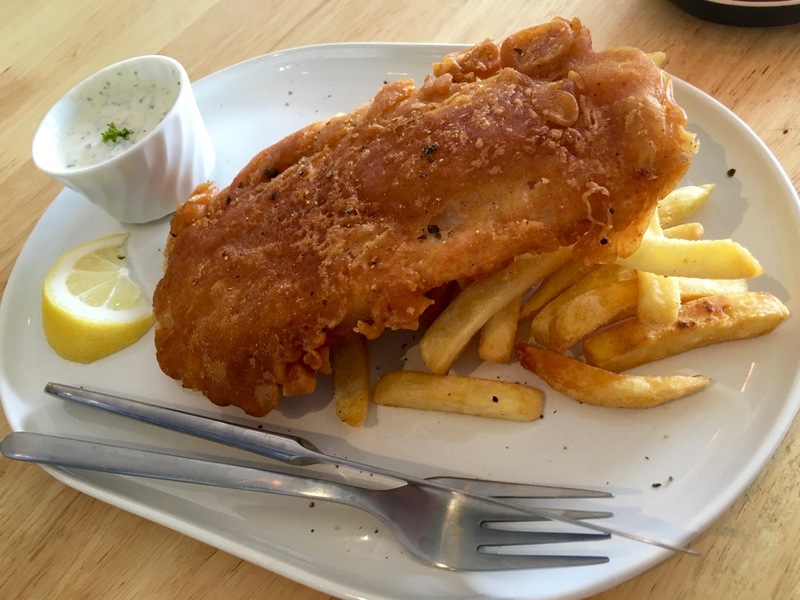 One day I decided to try fish and chips there, and it was amazingly delicious. One thing I like about the coffee drinks is the presentation. 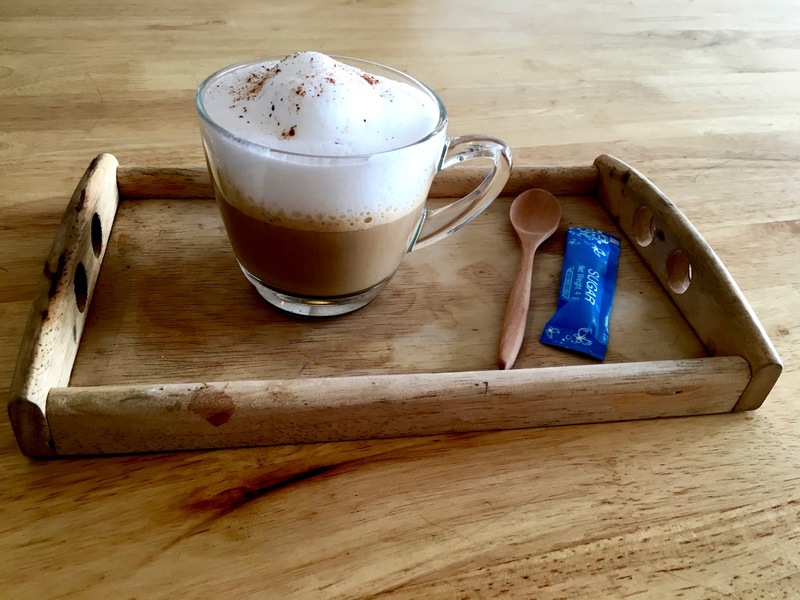 Here’s how they serve a cappuccino, in a wood tray with a little wooden spoon and a packet of sugar. If you know anything about Bangkok, you’ve probably heard of Khaosan Road. For years and years, it was the international traveler haven of the city. Books have been written about it, books have been set here, and so on. 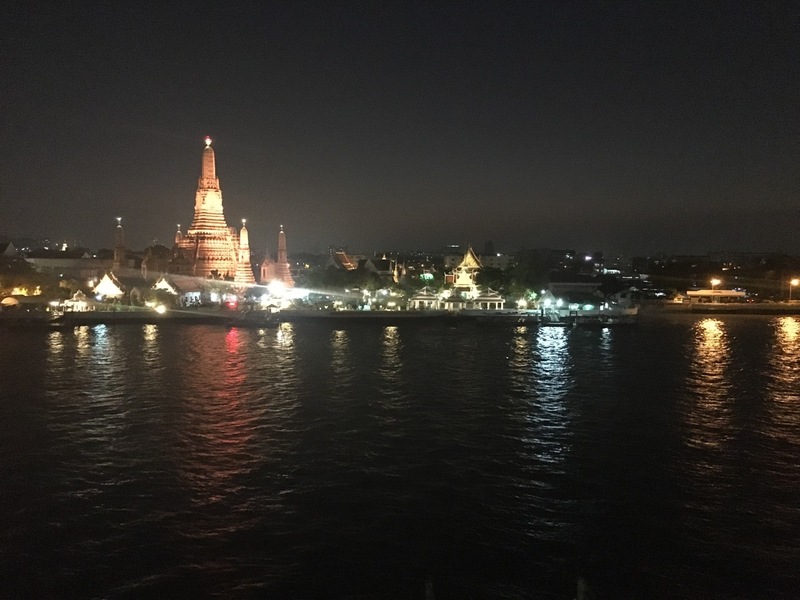 It contains one of the four red light districts of Bangkok (that I’m aware of – there may be more), a ton of bars and restaurants, and all forms of entertainment and shopping targeted to young international tourists with disposable income. Khaosan Road (sometimes spelled Khao San Road, and pronounced COW-sawn, not COE-sawn as many tourists say) is so famous that it’s the first thing people often associate with Bangkok. I remember when we were in Christchurch, New Zealand four months ago, there was a bar near the B&B where we stayed and it was called Khao San Road. Anyhow, we wanted to visit to see what it was all about. Not being too excited by hard drinking and ping pong shows, we didn’t really expect to be into the Khaosan scene so much. But we couldn’t say we saw Bangkok until we saw what others so often saw about Bangkok. The advice we got was to visit at night, which makes sense. 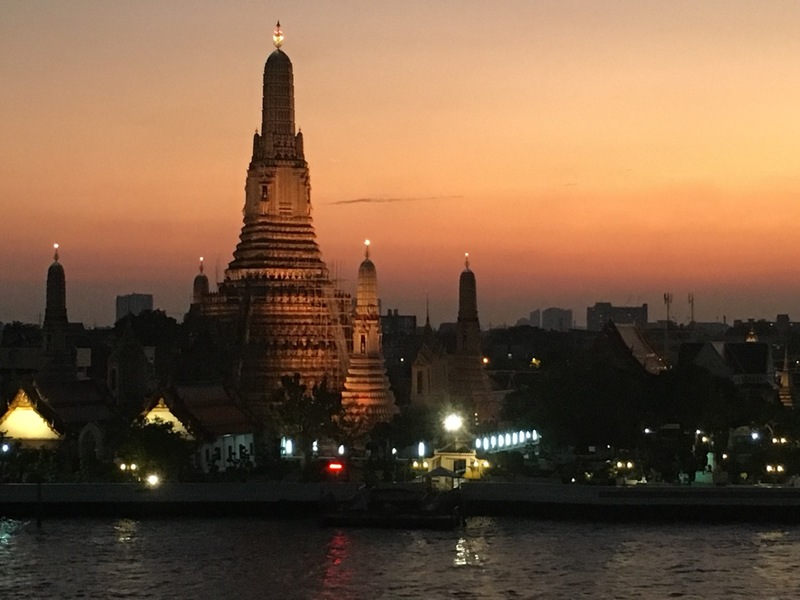 We decided to combine that with a trip to see Wat Arun, the “Temple of the Dawn”, at sunset. We’d heard it was really pretty, and there are bars and restaurants set up across the river from the temple just for this purpose, since so many people want to take in the sight around sunset. 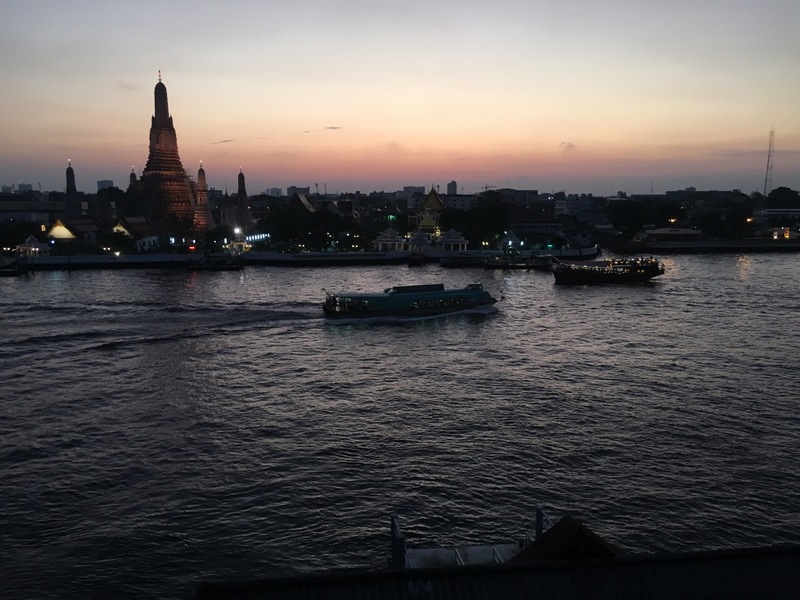 We had the Nancy Chandler map of Bangkok and after reading a little about the two places it recommends, we chose one that sounded more our style, Sala Rattanakosin. 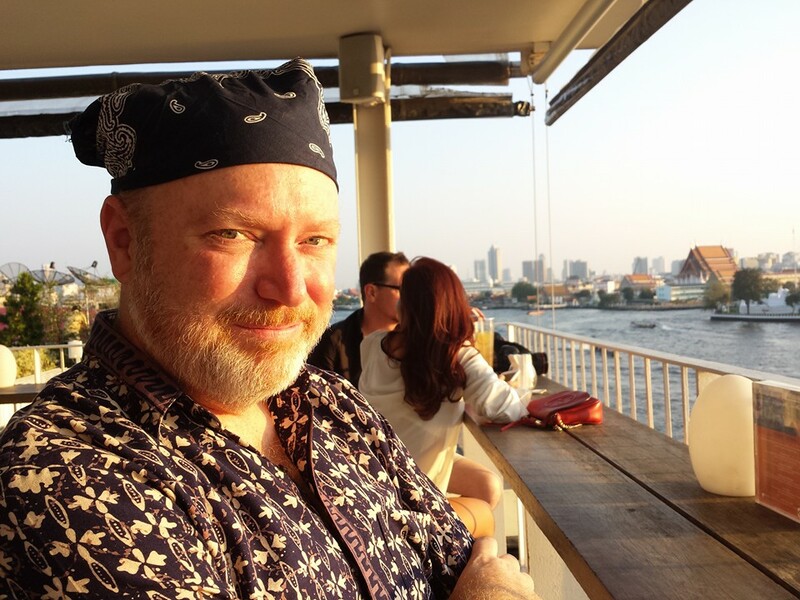 So one day we got on the orange Chao Phraya Express Boat, and headed north. Finding our way from the express boat pier to the restaurant/bar wasn’t too hard. Climbing the five flights of stairs was a bit more of a challenge, considering I’d sprained my knee the week before in Phuket climbing aboard a long tail boat. Drinks were very tasty but expensive. Food was also expensive. But the view was magnificent. We spent 2000 baht at this one place, which is $55. That’s the most expensive night out for us ever in Bangkok, and we didn’t even get a real meal, just one small appetizer each (and two drinks each). After we left Sala Rattanakosin, we caught a tuktuk to Khaosan road, paying way more than we should have, but getting there quickly. The Khaosan Road area was pretty much like what we expected. There were lots of Western tourists out in the streets and in streetside bars drinking away. Lots of backpacks. Lots of loud music. Lots of people selling stuff to tourists – sunglasses, bikinis, scorpion-on-a-stick to eat, toys that light up and go into the air, and so on. There’s a police station right at one end to make sure things don’t get too crazy for too long, I guess. We also got sales pitches from people selling custom tailored suits, ping pong shows, dinner, beer, and so on. I looked for little trinkets to buy to take my family and friends back home, but came up empty-handed. We found one shop of crafts that our Nancy Chandler map recommended because everything in it is Fair Trade, but they were closed by the time we got there. There are supposed to be some stores that carry used English language books, something you’d expect to see in an area full of tourists, but we couldn’t find them. So, with our hopes of shopping dashed, and still being full from the expensive rooftop restaurant, and not wanting to sit around and have a drink in the din of the street, and feeling hot and sweaty from the humidity, we headed for “home”. 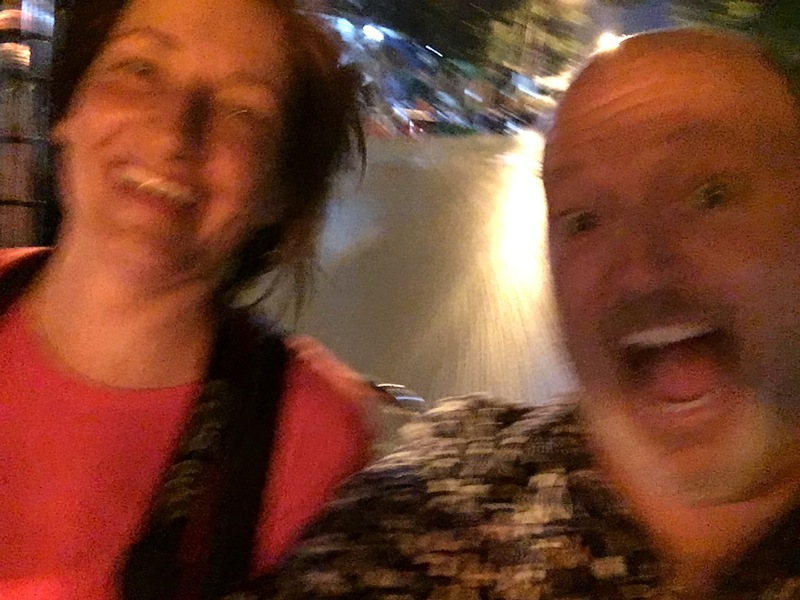 Beth flagged down a tuktuk, quickly negotiated an even more ridiculous price (since he’d pulled over where he wasn’t allowed to, and it was right in front of a traffic cop), and we were off through the late night streets of Bangkok. Here’s a photo of us holding on for our lives. I may have made it look and sound a little more dramatic than it really was.